Today's test system consists of the hardware listed below, and as with all good testing a clean install is used and the latest Windows Updates are applied. The applications and games used in today's tests are the latest that was available at the time of this analysis - links to demos and free trials are provided when applicable. Please note, no ultra-high-resolution tests have been included in today's results due to NVIDIA not supporting dual monitor spanning, which are only present with a triple monitor NVIDIA Surround setup (not the same as extending your desktop). It's something we'll look at once a higher resolution single monitor or triple monitor setup is acquired. 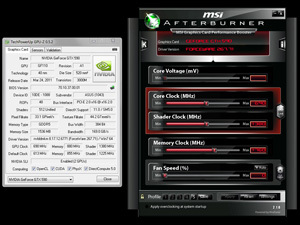 ASUS's GeForce GTX 590 clocks were slightly higher than the reference clocks found in NVIDIA's documentation, however this is the same clock speeds as the cards that ASUS will be initially selling. The minor increase of clock speeds didn't present any boost in our benchmarks, marking it a fair representation of what you can expect from a reference product. 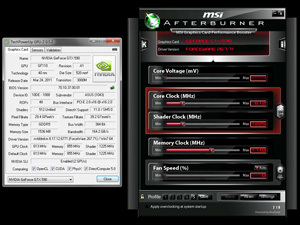 At the time of reviewing the GTX 590 the overclocking software utilised didn't fully support voltage adjustment and had variances with the clock reporting. While a beta version did allow for voltage adjustments, it was not acquired in time for this review. So it's something we will look at in the future review, as there is plenty of performance to be had for those willing to experiment with core voltage adjustments. Therefore, we settled for a modest overclock of 690 MHz on the core and 1760 MHz (3520 MHz effective). And while there is definitely much more in the card, but due to a possible mixtures of early drivers and/or software we had trouble stabilizing a core and memory overclock at the same time. We have compiled a list of popular and graphically challenging games which include titles utilising Microsoft's DirectX 9, 10 and 11 API's for testing today; tested in 1920x1200 and 1680x1050 resolutions that are most commonly used by gamers based on Steam's hardware survey. ASUS' GeForce GTX 590 and OC results are highlighted in orange.